Timberwolves star Kevin Love is still hoping for his first All-Star start. 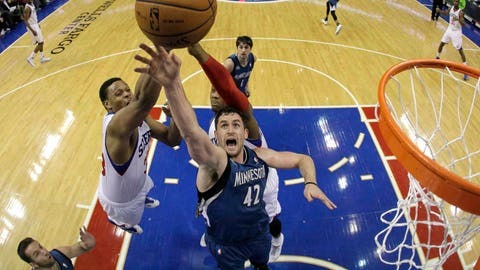 MINNEAPOLIS — Sometime after the Timberwolves’ win Monday at Philadelphia, Kevin Love playfully accused Ronny Turiaf of theft. The backup center played for a while with Love and the rest of the starting unit (minus Nikola Pekovic) in his first game back from injury and aggressively snatched nine boards. According to Turiaf, Love — who pulled down seven boards in a rare non-double-double — said a couple of them were rightfully his. Had his teammate been a little more selfless, Love kidded Turiaf, the stud power forward would’ve remained atop the NBA’s rebounding charts. "He reminded me yesterday that I stole two rebounds from him," Turiaf said with a grin, "so he lost his lead, supposedly." While Love, the league’s No. 3 scorer (26.1 points per game) and No. 2 rebounder (13.2 boards per game) may have been kidding, he’s well aware of his standing among basketball’s statistical elite. And though he’s quick to downplay topics he finds trivial, Love says he’d sure appreciate that recognition from fans via a starting nod in next month’s All-Star Game. "Obviously, it means a lot when the coaches pick you as a reserve — it means you have a lot of respect around the league," said Love, who played in the 2011 and 2012 All-Star Games as a backup. "But to be an All-Star starter, you kind of have the best of both worlds. The fans are who you play for." Love isn’t clamoring for your vote. But the franchise that cuts his paycheck is. "What more can he do?" Turiaf asked, not kidding around this time. The statistical answer: not a whole lot. Love is on pace to become the 12th NBA player and third in the past 30 years to finish in the league’s top three in both rebounding and scoring. He’s trying to become the league’s first player since Kareem Abdul-Jabbar to average 25 or more points, 13 or more rebounds and four or more assists per game. His 30 double-doubles lead the NBA. Yet, in a third set of ballot returns released Thursday, Love was 17,933 votes behind the Clippers’ Blake Griffin for the Western Conference’s third and final frontcourt spot. Fans have until Jan. 20 to vote for starters via text message, Twitter, Facebook, Instagram or the NBA website. So the Timberwolves’ business office is in the midst of its latest push to "Show Kevin Some Love." In fact, that’s the name of the team’s current online and in-game campaign. Such lobbying conjures memories of Mr. Love Miracle Glass Cleaner and Numb#rs. But this is different. This time, you’re the target. Past strategies were geared toward national media in charge of determining end-of-season awards. But it’s the common fan that can grant Love his first All-Star start, so that’s who the Timberwolves are going after — social media ads and promotions, Love-autographed memorabilia giveaways, and the like. During Wednesday’s game against Phoenix, in-arena hosts encouraged spectators several times to pull out their mobiles and vote for Love in a variety of ways. After the first such segment, it was announced that 1,700 votes were cast in about 20 seconds. Such support isn’t lost on Love. "It means a lot," he said. "Obviously, the fans have done a great job. I thank them for that. The organization is definitely making a good push. I appreciate all the help, and if not hopefully I can play myself there." That should be pretty much a lock for the All-Star Game, which takes place Sunday, Feb. 16 at New Orleans Arena. But Love’s resurgence this year after missing most of last season with a hand injury merits more, Turiaf and the gang say. "Obviously, I’m biased, but I think there’s no question he should be (a starter)," rookie forward Robbie Hummel said. "You look at the stats he puts up, the numbers he gets with rebounds and points, there’s no question in my mind he deserves to be a starter in the All-Star Game." Said point guard Ricky Rubio: "He deserves it. He’s playing awesome. It’s something that everybody is saying.